Perhaps the most ferocious frigate action ever? Single ship actions, usually between frigates, are remembered as some of the most dramatic actions of the Age of Fighting Sail. They captured the imagination of the public in their own time, making heroes of captains like Pellew and Cochrane, who gained the sort of adulation reserved for pop-stars today and they figure as central elements in the naval fiction of Forrester, Pope, Kent, O’Brian and others. Perhaps the most dramatic of all single-frigate actions occurred not during the Revolutionary or Napoleonic Wars, but when France was locked in conflict with Britain during the American War of Independence. This ferocious battle was fought by the British frigate HMS Quebec against her French counterpart Surveillante. What follows serves to give an impression of this now largely forgotten epic. Surveillante’s‘ white ensign is that of the Royal French Navy – not a sign of surrender! In the early summer of 1779 the Quebec, a small 32-gun frigate of 685 tons, armed with 12-pounders, was sent to Guernsey, as a guard for the Channel Islands, with orders to glean all the intelligence possible of French movements in and around Brest. Her captain, George Farmer (1732-1779), was well thought of in the service. Nelson had served under him as midshipman in the frigate Seahorse, and Farmer thought well enough of Nelson to entrust him the duty of a watch-keeping lieutenant. From Guernsey, Farmer sent a report on the 18th June that the French fleet had sailed from Brest, and in early July he intercepted and broke up a convoy of forty-nine French coasters, taking some and driving many of the rest ashore. In the process however the Quebec ran on to a rock and Farmer only got her off by throwing all his guns overboard. This necessitated a return to port to repair damage and to rearm , and the Quebec was lucky to reach Portsmouth in safety. On arrival however no 12-pounders were to be had and Captain Farmer had no option but to accept 9-pounders – a critical factor in the action to come – and to get to sea again as quickly as possible. By October 6th he was off Ushant, in company with an armed cutter, the Rambler, commanded by a Lieutenant James George, keeping a watch on Brest. At daybreak Quebec and Rambler sighted a large French frigate and an armed cutter, and in another half hour the frigate opened fire and hastened to investigate. The French frigate proved to be the Surveillante, commanded by the able Lieutenant Du Couëdic. She was a considerably larger and more powerful vessel than the under-gunned Quebec, carrying 34 guns, apparently a mix of 12 and 18-pounders. Due to the substitution of Quebec’s of 9-pounders for her previous 12-ppounders the French ship was by at least thirty percent the more powerful fighting machine of the two, She had a crew of 255 men as against the Quebec‘s 195. The action opened in mid-morning and was fought in a heavy swell, though little wind. Du Couëdic kept his ship close-hauled on the port tack, while Farmer, sailing free on the same tack, edged down towards him. At ten o’clock, or a few minutes after, the Quebec hoisted her colours, hauled her wind, and began to return the enemy’s fire at short range . In the cannonading that followed, lasting a full hour, neither side had the best of it. Then the Surveillante drew ahead and Farmer, quickly backing his topsails, put his helm up and tried to go under her stern and rake her. Du Couëdic bore up simultaneously to frustrate the manoeuvre and both ships were before the wind, masts tottering and sails in tatters. Both vessels were taking heavy losses. Some of the Quebec‘s guns-crews were reduced from seven men to three. Farmer had sustained a broken collarbone and a smashed finger but he remained on deck to encourage his dwindling crew. The first lieutenant had his arm shot away but when the surgeon had done with him he returned to the quarter-deck. Twice the fire of the Surveillante ceased, and the Quebec’s crew cheered, thinking they had her beaten – but each time, after a brief interval, the French reopened fire with increased vigour. The gunnery duel continued until about one o’cIock when the Surveillante‘s masts went overboard together. They fell in the most fortunate manner for her, on the disengaged port side, and her fire remained unimpeded. Five minutes, before Farmer could take advantage of his enemy’s plight, the Quebec’s masts followed suit, the fore and mainmast falling inboard, blocking the gangways, and putting the guns on the forecastle and quarter-deck out of action. Worst of all the mizzen-mast fell outward on the engaged side, and the mizzen-topsail completely covered over the port-holes of several of the broadside weapons forward the stern. Neither vessel was under control now and as they drifted they locked together, Surveillante‘s bowsprit becoming entangled in the wreckage of masts and sails which encumbered the Quebec’s decks amidships. Du Couëdic called for boarders, but when preparing to launch an assault was struck down by a musket ball –the third wound he had received during the action. His officers, though momentarily shaken by his injury, were rallying the boarding-party, when the issue was taken out of their hands. The Quebec’s mizzen-topsail, which had been masking the stern guns on the port-side, since the mast had fallen, now caught fire. The guns crews continued to blaze away through the tattered canvas hanging a few feet from the muzzles. 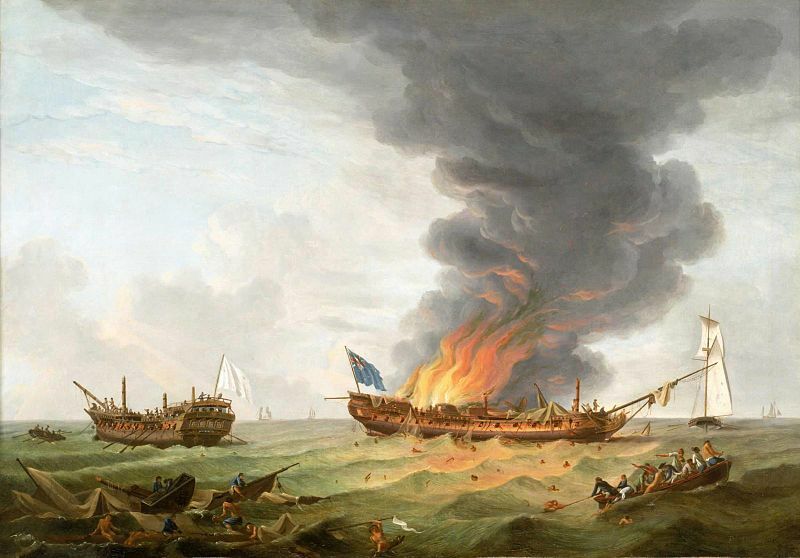 The flames ran up the sail, took fierce hold on the wreckage on the quarter-deck, and in an instant were roaring over the after part of the ship. The French, abandoning all thoughts of boarding, used every effort to get clear, fending the Quebec off with spars and booms. They were only just in time, for the stump of their bowsprit was a mass of flame, only quenched with difficulty as the two ships were disentangled. The engagement was over, and the Quebec was doomed. 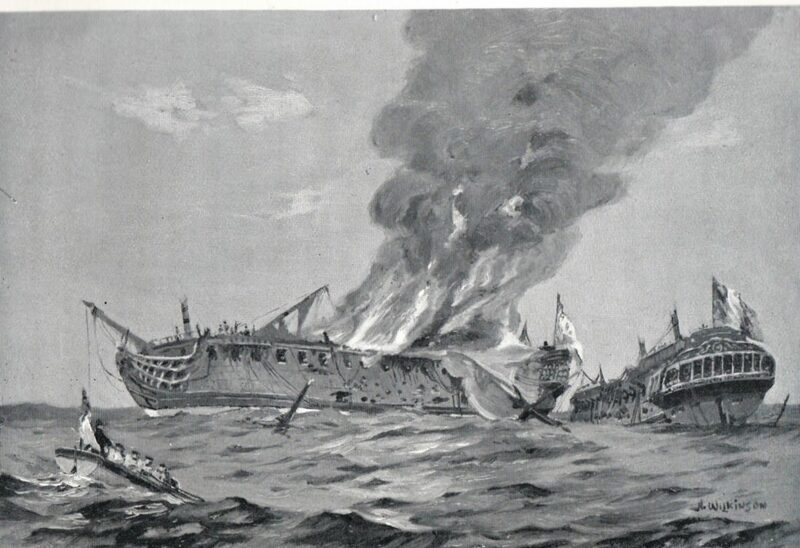 du Couëdic, wounded, gave orders that when the flames in his own ship had been extinguished firing should cease and the Quebec’s crew rescued – many had already jumped overboard to escape the flames. All Surveillante’s boats were too damaged to float however and nothing could be done but to throw ropes to any survivors who could swim alongside. In the Quebec Captain Farmer gave orders to flood the magazine, and took what measures he could to fight the fire. This proved hopeless but Farmer refused to leave his ship. In mid-afternoon the magazine exploded. The hull burnt fiercely for a considerable time before it sank. Though accounts of the exact manner of Farmer’s death differ there is no doubt that he went down with the ship, her flag still flying. Painting by British painter Richard Dodd shows the Surveillante (L) keeping as far away as possible from the doomed Quebec as explosion was clearly imminent. The cuttler on the far right is probably the French cutter Expedition. In the foreground note Rambler’s boat rescuing survovors from the Quebec. The Surveillante saved some of the Quebec‘s crew, the Rambler a few more and 13 were picked off afterwards a mass of floating wreckage by a Russian ship that was in the vicinity, and landed at Salcombe, in Devon. Another 14 were spotted on other flotsam but as the Russian altered course to pick them up a heavy squall came on, and when it lifted they were gone. Out of Quebec’s company of 195 only 68 were saved. 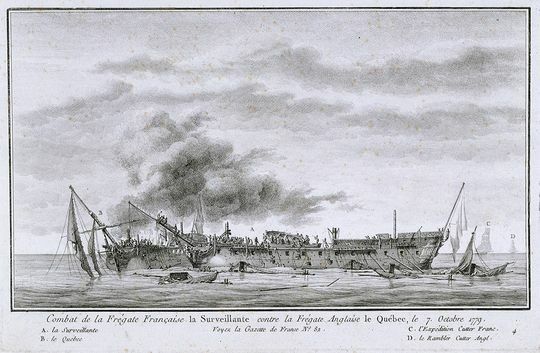 The Surveillante lost 115 killed and wounded out of 211 – a 50% casualty rate and she was towed to Brest harbour by the Expedition in a sinking condition. du Couëdic, was promoted immediately but died a few months late as a result of his wounds. The French behaved with the notable chivalry to the Quebec‘s survivors picked up by the Surveillante. They were sent back free to England on the grounds that the French Minister of Marine “did not think it right to consider as prisoners of war unfortunate men who had escaped the fight, the fire which blew up their ship, and the watery gulf into which they had been hurled.” It was particularly touching that Du Couëdic, of the Surveillant, despite his own ultimately wounds, took pains to see that they were made as comfortable as possible. The accounts I have seen of this action make no reference to the compensation or pensions paid to other members of Quebec’s crew. Nothing could have been too much for the men who endured the hours of hell this ferocious battle lasted and one only hope that the widows, orphans and dependents received some recompense, however small.